After Brexit, what next for British demand? The pound has taken a beating in the foreign exchange markets, and the outlook for poor old Sterling doesn’t look great for the rest of this year. This might stop the growth in British demand for Spanish property in it’s tracks. 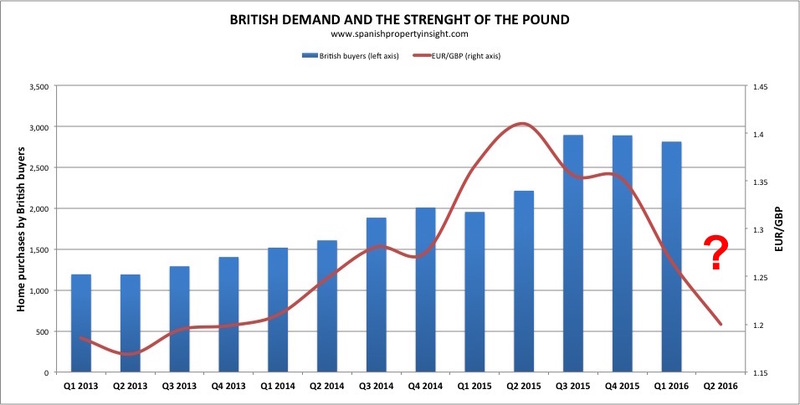 As you can see from the chart above, the strength of the pound against the euro is one of the principal drivers of British demand for homes in Spain. When the pound goes up, British demand follows with a lag of about one or two quarters before it shows up in the property registry’s figures. You can see how British demand peaked in Q3 last year, one quarter after the pound peaked against the euro. It then fell slightly on a quarterly basis as the pound started to slide, though year-on-year sales figures were still up dramatically. Since then the pound has dived on Brexit fears, and now slumped further after the vote confirmed the UK was leaving the EU, stunning pretty much everyone. So what happens next to British demand? We will have to wait until the Registrars publish their Q2 figures in August, but I expect a big reversal of the growth trend we have seen since the start of 2013. If the vote had gone the other way, the pound would have surged, and there would have been a fresh stampede of British buyers into Spain. C’est la vie. How far will demand fall? The Q2 figures might still be above 2,000 sales, but I won’t be surprise if the Q3 figures come in below 2,000, though anything above 1,000 sales/quarter would still leave the British in the lead as the biggest group of buyers (the French are the next biggest group with around 1,000 purchases per quarter). The toxic mix of a weak pound and Brexit uncertainty just can’t be good for British demand. But if the pound recovers quickly as investors start to see a bright side for the UK outside the EU, which is always possible, then British second-home buyers will be back, Brexit or not. Spanish property prices are just too low to resist if the pound is strong, as you can see from this comment in the forum: Corvera golf prices down from €220,000 to €44,000. The question Many potential British buyers will be asking before they buy is whether they will be able to retire there 365 days a year or go to work there –if their Uk state pensions will still be updated annually or whether they will be restricted to having a holiday home that they can go to for a limited periods from time to time or to a limited number of days per year remaining Uk resident. Rather important because if they cannot risk selling up in the UK and they cannot use that capital to buy in Spain or have a lump sum to enhance their living in Spain. So we will want to know the intentions of the Spanish Government too – will they help at all – in particular guaranteeing not to upset people properly resident now and the future prospect. It seems unlikely BREXIT will be overturned but maybe we will be back in the European Economic Area (EAA) that will give us some protection like the EHIC card and the lower CGT but the fall in the exchange rate of the £ will not help buyers or people’s spending budgets. Equally the Spanish shops hotels and restaurants will miss the sudden ‘affluence’ of the Ingles over the last year when £ was up to around 1.40 and now down to around 1.15 ! All good points. An EEA arrangement like Switzerland is the most likely. It doesn’t help that Theresa May has refused to say that people who are already expats (Brits in the EU, and EU nationals in the UK) will have their status guaranteed, despite this being a claim made by the Leave campaign. “The right of EU migrants already in Britain to stay here should be guaranteed. Making it subject to negotiation is morally wrong and economically self-defeating.” says The Times today (and the same applies to British expats already in Spain). There is so much uncertainty and nobody knows what will happen. We will just have to keep a close eye on it and wait and see.